This is a wonderful and fun social activity for high functioning residents in nursing homes and assisted living facilities to enjoy. The completed wreaths are stunning! Note: Craft wire is sometimes sold as ‘wreath wire’. 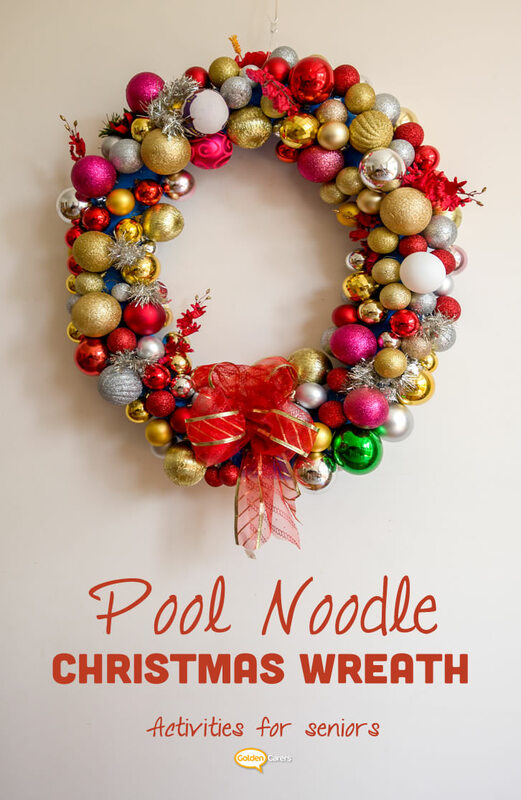 The wire must be malleable so that it can be easily folded but firm enough to hold Christmas balls when inserted into the pool noodle. Craft wire, 20 or 22 gauge or similar. Turn noodles into wreaths by making diagonal cuts at both ends of noodle and joining ends with duct tape. Cut several dozen lengths of wire 3.5” inches or 9 cm long. Place wreath on the table for two clients to work on. Attach hanging string on noodle. Start inserting balls onto wreath: Insert a piece of wire through a Christmas ball’s hanging loop, fold and insert deeply into the noodle so that the balls are attached firmly. Place as many balls as possible on wreath; don’t worry if there are gaps; you can fill them up with smaller balls. If any gaps remain, fill with tinsel and other decorations. You may need to use some glue. Great idea for using pool noodles - and they are inexpensive too! home. Lots of comments given. Thank you so much for your feedback Jane! So glad it worked for you! Merry Christmas and a very Happy New Year to you too!